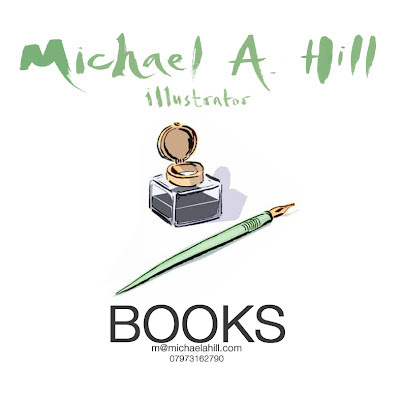 I have put together a pdf of recent work I have illustrated for book publishers, this includes The Green Wiccan Herbal by Silja, The Green Wiccan Book of Days by Silja, 52 Weekends by the Sea by Craig Easton & Brigid Benson, Dear Dylan by Siobhan Curham, If the buddha dated by Charlotte Kasl, A Guide to Good Housekeeping by Christina Strutt, The Garden Farm by Christina Strutt and London Walks by Gill Knappert. If you want to know more about the projects or have a project you would like to discuss give me a call or email. 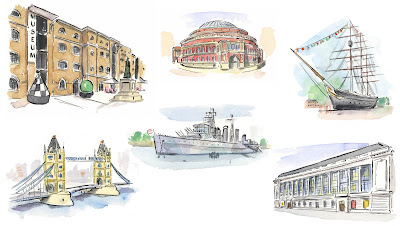 As part of a recent project on London I had to produce about 50 illustrations of London Landmarks or sights. These were produced as lovely little watercolour vignettes. These included such sights as Buckingham Palace,Big Ben and the London Eye. You can see more of them on my webiste by clicking on the places link. I have this week uploaded some new illustrated garden plans to my website. You can view them and all the existing ones by clicking on the 'Garden' link above.